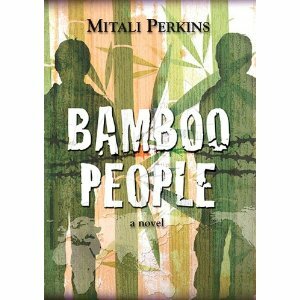 Bamboo People by Mitali Perkins. Charlesbridge. Publication date July 2010. Reviewed from ARC from publisher. Imagine going to a job interview and, instead, being dragged into a bus and forced into the army. That's exactly what happens to Chiko, 15. One moment, he's worrying about his father, a doctor imprisoned by the Burmese Government, wondering how he and his mother will pay the rent and buy food. The next, he's in the jungle, being given military training to fight rebels on behalf of Burma. He's a most reluctant soldier. Tu Reh is not a reluctant rebel -- he wants revenge against the Burmese soldiers who burn his peoples villages. What happens when Chiko and Tu Reh cross paths? A full review will be posted closer to publication date! This looks great! Thanks for the sneak peek. I'll post the full review closer to the pub date.